Summer is a time to get some outdoor gardening done. We are almost finished a project that we've been wanting to do for years. The people that built our house set up some very small planting areas, and they did it in a way that the driveway comes right up to within 24" of the front of the house, and a sidewalk is right against the side. That's fine in a city lot, but we live on a rural lot that is 1 1/2 acres. We have some space to not crowd the house! So, we pulled up whatever plantings were in these zones, built up some retaining walls, filled it with fresh soil, and put plants back in. 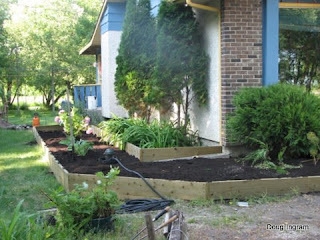 Here is just after we start putting the plants back in. We've added some more since the photo. Its looking a lot better, and will look better yet, as they grow in. Posted by Doug Ingram at 10:38 a.m.